Isfahan is one of the oldest inhabited cities in the world – it has witnessed the rise and fall of civilizations that have had the some of the deepest impacts on world history. The city’s story begins around 2500 years ago, with the Sassanid empire. Isfahan was a prominent religious city, with its large Zoroastrian Ateshkadeh (Fire Temple), the remains of which still echo with early Sassanid influences. During the early Islamic Caliphate, Isfahan acted as a prominent religious and cultural city. The Abbasids gifted it with a few noticeable town structures due to its proximity with their capitals, Baghdad and Samarra. It passed from Abbasid hands to the Buyahids in the 9th century. The Buyahids were masters of construction – a lot of magnificent mosques, public squares, elite residential lodges, and markets soon popped up, as well as a strong defensive city wall. In 1047, the Seljuks of Rum (Rome – Anatolia and Turkic region) subsequently conquered Persia, and made Isfahan the capital of the Persian Empire. For the next 2 centuries, Seljuk architecture, rich in its geometric patterns and traditional symbolism, dominated the major public spaces around the city. Isfahan was soon plundered by incoming Mongol hordes who wiped out the Seljuks – its residents were tortured, and its buildings razed. It was not until the Safavids arrived, and Shah Abbas I shifted the capital from Qazvin to Isfahan in 1621, that Isfahan began to redeem its status as the splendid city it had been. Shah Abbas I came as the city’s savior. He commissioned the construction of public buildings – mosques, libraries, plazas, shrines, wide paved streets, as well as majestic royal castles and guesthouses, started adorning the city. The splendid Naqsh e Jahan Square (Imam Square), which today is the 3rd largest public piazza in the world, became the center of the new Isfahan. A large Jami Mosque was constructed facing the square from the south, and another one dedicated to Sheikh Lutfullah, its dome beautifully ornamented with blue and golden mosaics and calligraphy, faced the square on the east side. Isfahan’s population soon shot to above a million residents – a strong indicator of the prosperity of the city. When counterpart European cities were plagued with crime, unemployment, poverty, and feudal injustice, Isfahan offered Muslims from all over the Islamic Empire a safe refuge they could all call home. Foreign merchants marveled at the rich hand-woven carpets that Isfahani craftsmen produced, and the intricacy of their silverware and tile work. After Shah Abbas passed away, Isfahan was not given much attention by Safavid rulers, who preferred reclining in the castles to actually running public affairs. 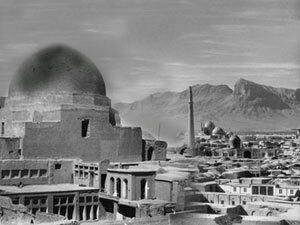 Consequently, the city’s image began diminishing, and soon afterwards Shiraz, and then Tehran, was made the capital of the Empire after the fall of the Safavids.